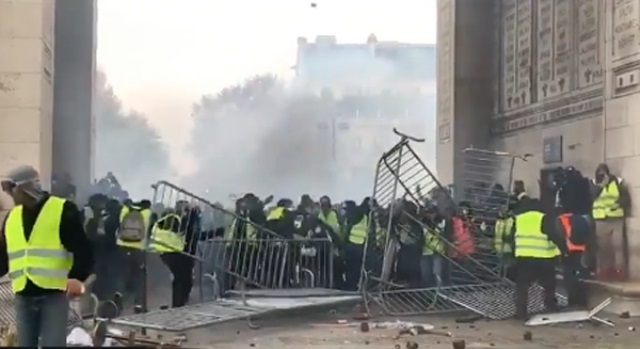 "Here's What's Actually Happening in France"
An "American living in Paris" revealed the alleged real story behind the yellow jacket protests in France in a viral post to the Pro-Trump r/The_Donald subreddit on Tuesday. In addition to this, retired people have been lodging their dissatisfaction with their retirement pensions (one woman in a video circulating around French Facebook confronts Macron about having to live off of 500Euro a month) and Macron's reactions have been condescending across the board. He currently has about a 26% approval rating. A poll conducted on Sunday by Harris Interactive found "72 percent of French people support the yellow vests, even after Saturday's riots," according to NPR.